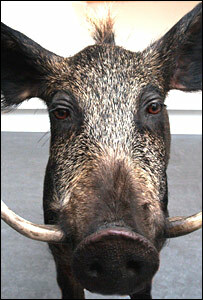 Grice Pigs, also known as the Highland, Hebridean or Irish pig, are an extinct pig from Scotland and Ireland. They became extinct, surviving longest in the Shetland Isles, where they disappeared in the late nineteenth century. Accounts from the early 19th century suggest the grice was an aggressive animal with small tusks, an arched back, and a coat of stiff dark bristles over a fleece of wool. Most likely ranchers stopped breeding them and turned to more docile pigs.